The 8th edition of Periferic Biennial for Contemporary Art attempts to re-address the question regarding the conditions and possibilities for producing art events in Romania, in the new situation created by the recent economical developments. The 8th edition of Periferic Biennial for Contemporary Art attempts to re-address the question regarding the conditions and possibilities for producing art events in Romania, in the new situation created by the recent economical developments. The event proposes self-repositioning and the involvement of different layers of public in order to grant a dynamic and democratic access to contemporary art events. The concept of the biennial proposes an alternative model of exchange and raises the question “can art be regarded as a gift?”. While Periferic Biennials have always challenged the market-based mechanisms of contemporary art, Periferic 8 directly analyzes the speculative methods that influence the realization and social value of art. The social practice of gift-giving in an everyday sense is experienced as a positive gesture, since everybody enjoys receiving and giving gifts. The exchange can be mutual, but it reflects a complex system of different motivations: power relations, dependence, as well as desire for prestige. Gift-giving is also used as a metaphor for describing the economics of art from creation/production through sharing/distribution to reception/consumption. Periferic 8 deals with the question how the values and commodities of art are created, which are in transaction on the intellectual and commercial art market. The two end poles of the survey are art strongly connected to the market and being commercialized and gift economies suggesting alternative economic models. 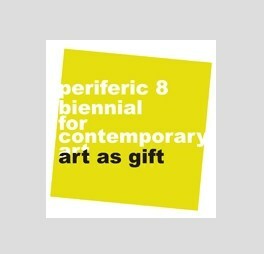 Periferic 8 wishes to play the role of a mediator, thus fortifying the dialogue between various cultural fields. On the one hand it presents alternative models of education by activating the already specialized audience, artists, art critics and theoreticians, on the other hand it involves other segments of local intellectuals and people interested in the processes of reception and mediation. The project seeks to strengthen local cultural consciousness in order to form a dynamic civil community that feels responsible for its own context and suggests that contemporary art is a transdisciplinary field where social and political issues that affect a wide range of people can be discussed.